If you’ve ever wished your board games had an extra sprinkle of magic and a Rainbow Dash more friendship, then you should be playing My Little Scythe. 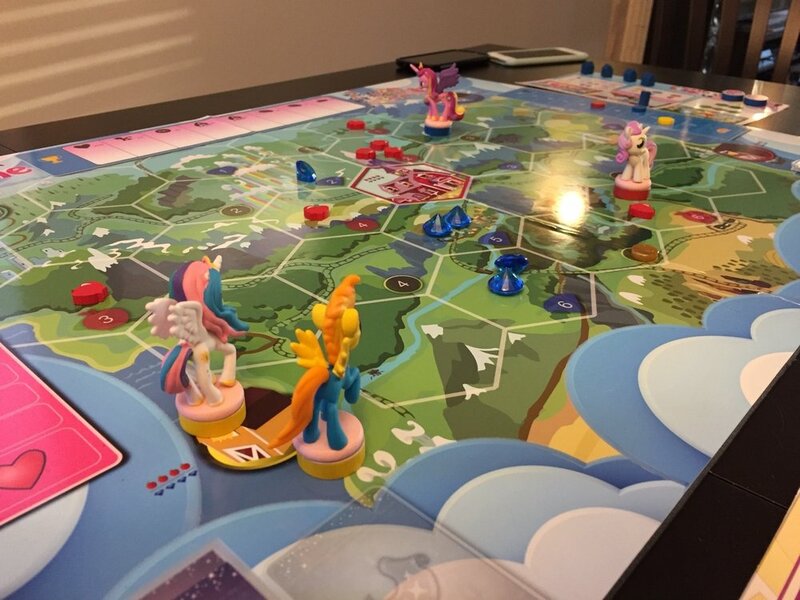 Created by 6 year old game designer Vienna Chou with the help of her father, Hoby Chou, the game puts a My Little Pony twist on the hugely successful Scythe which raised $1.8 million on Kickstarter in 2015 and is now ranked the 7th best board game of all time. My Little Scythe’s gameplay is inspired by the original, but the fun theme and simplified rules make it more accessible for children and casual gamers. Both Vienna and Hoby have worked hard to make the artwork, graphic design, and theme integration impeccable, and their project has even impressed Scythe designer Jamey Stegmaier. We were very excited to get the chance to interview Vienna about designing My Little Scythe, and what she might be working on next! For some of the questions, her father elaborates on her answer and his response is marked in italics. Where do you live, and how old are you? I live in Vancouver, Canada and I just turned 6 years old. What’s your favourite game, and why? I currently enjoy playing Connect Four most because no one, not even adults, can ever beat me. I’m not even kidding. What do you like about playing games? How did you come up with the idea of My Little Scythe? Why did you want to make it? My Little Pony is my favourite cartoon and Scythe is a game that I like playing with my daddy. My mommy doesn't like these more complex games and neither do my friends. So we wanted to make it easier for others to play with us by making this game. How did your dad help you make it? He did all the computer work and listened to my ideas. Hoby: Vienna was my world-builder and subject matter expert when it came to what would work or wouldn’t work with kids. As a theme expert, she ensured that the design and mechanics we experimented with aligned with the world of My Little Pony. As a child gamer, she helped me look at various aspects of Scythe & our initial prototypes to identify what might be too challenging for the average kid or casual player. She also came up with the idea of rolling die to ‘Search’ for resources, something that kids rather enjoyed. This also helped speed up the production of just about everything within the game. Did you like making it? What was the best part of creating it, and what was the hardest part? Making the game was fun because I like making things with my mommy and daddy. Choosing colours and art and reading what people say about our ideas was the best part. The hardest part was creating those videos! They take too long! My Little Scythe for everyone! Have you played My Little Scythe with your friends? What did they think of it? Yes they all thought it was really good and they all wanted to play with it again and again--even the boys! But I have the only copy and they couldn’t take it home with them. Do you want to make more games? Do you have any ideas about what they may be? Yes. My daddy and I are currently making a figure skating card game. I’m a figure skater and our sport never gets games. I think mine might be the first game about figure skating. We tested it at a park last week and a lot of kids came over to play and gave us even more ideas. Hoby: While Vienna continues testing her figure skating game with kids and figure skaters, I’ll be working on a followup to My Little Scythe that includes a different theme and different mechanics. Of course Vienna will provide input into the design and play testing of that too! Who’s your favourite pony from My Little Pony, and why? I like Princess Celestia, Princess Luna, Princess Cadence, Twilight Sparkle, Rarity, and Pinkie Pie. That’s 6! I like them all because I like all princesses, because they’re strong and good leaders. I like Twilight Sparkle’s magic, Rarity’s outfits, and Pinky Pie’s parties. I can’t just have one favourite. I used to want to be an astronaut and visit other planets, but after reading some books I learned that the other planets look too scary. So I will probably become an artist instead and keep making beautiful things. If you’re like me and want to play My Little Scythe right now, it’s available for anyone to try! The game isn’t for sale, but Vienna and Hoby have provided everything you’ll need to make your own Print and Play version (download here)! The files will only be online until this Sunday June 11th, so make sure you grab them before you miss out. Everything else you need for the game, including the rulebook and components list, is on their website. It’s safe to say that I can’t wait for the next project from this game designing duo!